KANSAS CITY, Mo. (AP) — For entirely different reasons, young quarterback Patrick Mahomes and the Kansas City Chiefs‘ defense had shared most of the public’s attention through the first four weeks of the season. Yet in their biggest test so far, against a Jacksonville team that reached the AFC title game a season ago, Kansas City responded with its most complete performance. Mahomes was still humming against the Jaguars‘ top-ranked defense Sunday, while the KC defense piled up five sacks, forced five turnovers and returned one of Blake Bortles‘ four interceptions for a touchdown in a 30-14 rout . The Chiefs (5-0) certainly appear to be special right now. They’ve already scored 175 points to set the franchise record for the five-game mark, while Mahomes threw for 313 yards against Jacksonville to give him a franchise-best 1,513 yards through Week 5. Mahomes has four straight 300-yard passing games, becoming the first QB in NFL history with four in his first six career games. He will try to set the franchise record with five consecutive games when the Chiefs head to New England for a Sunday night showdown this week. Indeed, it sure seemed as if the Kansas City defense played with a chip on its shoulder after hearing all season how bad it has been, and hearing all week how good the Jaguars would be. The Chiefs held on fourth down inside their 5-yard line early in the second quarter. They held again on fourth down late in the game. They strip-sacked Bortles, picked him off four times and returned one for a touchdown, all despite losing a handful of players to injuries and ejections . Chris Jones, who had the pick-6, was ejected after dropping an elbow on a Jacksonville lineman. Pass rusher Dee Ford followed him to the locker room a few minutes later after getting a second unsportsmanlike conduct penalty. Outside linebackers Justin Houston (hamstring) and Tanoh Kpassagnon (ankle) joined Eric Murray (lower leg) and fellow safety Armani Watts (groin) in getting banged-up. Yet a bunch of unheralded fill-ins responded quite well. Rookie pass rusher Breeland Speaks brought some pressure late in the game. Kpassagnon played well until he went down. And young safety Jordan Lucas, who was traded from Miami just before the start of the season, picked off his first pass after spending most of the season playing special teams. 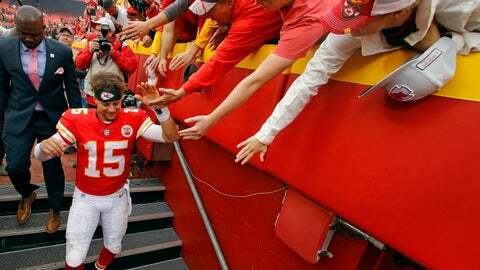 The result has been another 5-0 start, the Chiefs’ third under Reid and second in a row. But while last year’s team followed with six losses in a seven-game stretch, there are reasons to believe this year’s team will follow a different path through the middle portion of the schedule. It helps that this year the Chiefs appear to be a more complete team. “Last year we had a great team and we won a lot of games,” Mahomes said. “This year we’re just trying to learn from last year, the little drought we had, and just try to make it a procession.